High-quality systems used in video conferencing are called telepresence systems. The images are life-size yet not truly lifelike. They lack the depth that people would normally see if they were in the same room together. But this could change in the future with new kinds of three-dimensional telepresence systems. Last week, we told you about a 3-D system at the University of Arizona. Researchers can send a moving image over the Internet and show it on a special screen in close to real time. People would not have to wear special glasses like they often need to watch 3-D movies. The system uses a lot of cameras to take pictures of a person from different positions. Lasers reproduce the pictures combined into three-dimensional images, or holograms. The image appears more realistic with the more cameras that are used and the more pictures that are taken. 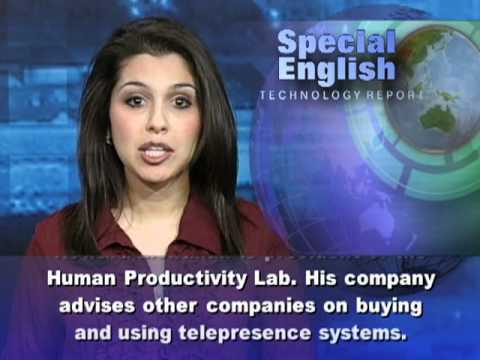 Howard Lichtman is president of the Human Productivity Lab. His company advises other companies on buying and using telepresence systems. Mr. Lichtman also publishes Telepresence Options, which reports on the industry. He says this latest development would have done wonders for the "Star Wars" movie with the famous "Princess Leia" hologram scene. The researchers in Arizona say their 3-D system is still years away from completion. Even then, Howard Lichtman says it may have trouble competing with systems already on the market. Most telepresence systems are two-dimensional. But Mr. Lichtman says the images are very realistic. He says it is a 2-D image, but it is clear and realistic. He says you would think you were in the same physical space with people who might be thousands of kilometers away. Howard Lichtman says prices for telepresence systems are going down as more people use the technology. A new eighteen-million-dollar project aims to create eleven telepresence centers for federal employees around the United States. The government is working with the AT&T company to save money and reduce pollution by reducing the need for travel. For VOA Special English I'm Alex Villarreal. For more reports about technology go to our website, voaspecialenglish.com. You can also find our programs online with transcripts and MP3 files. And you can find us on Twitter, Facebook and YouTube at VOA Learning English.